Anne Marie adding the hops. We’ve learned about the history of gose, we’ve tasted and evaluated several goses, now it’s time to brew a gose. Don’t fear for us, though: it’s not as hard as it sounds. It’s actually pretty easy. 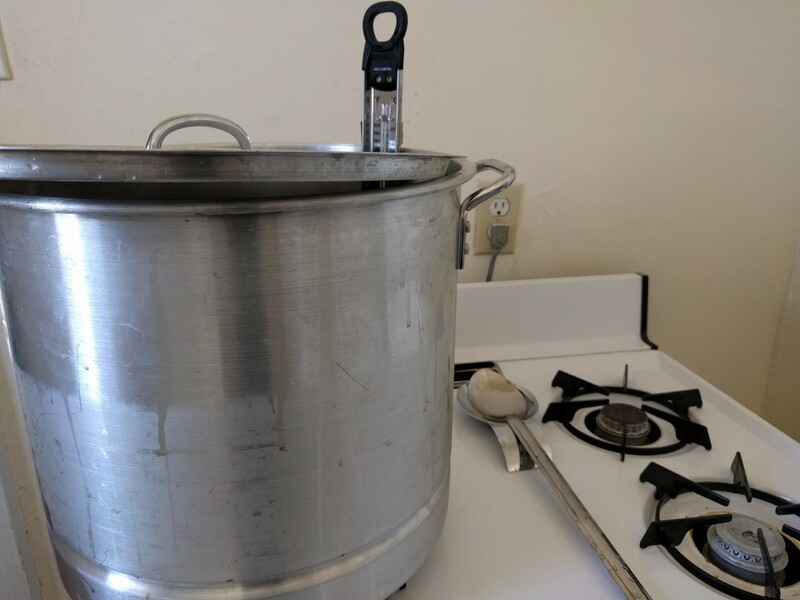 Brewing beer is just heating water and adding ingredients. And cleaning. Lots of cleaning. Really, it’s the cleaning that’ll get you if you’re not careful. 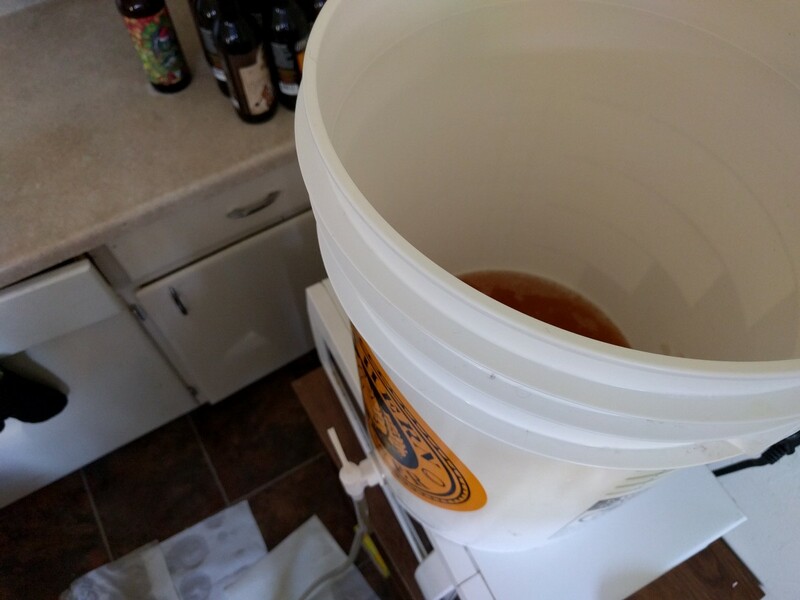 The two most popular methods for brewing beer at home are extract and all-grain. We’re not going to use either of those methods, though, because we’re beautiful, special, unique little butterflies. We’re going to use the Brew-in-a-Bag method. BIAB is a happy middle ground between the other two, being almost as simple as extract brewing, with close to the same level of control as all-grain. You’ll need a brewing kit (check out the Grape and Granary if you’re in Akron, Ohio), an eight gallon pot (I recommend this tamale steamer because cheap), a mesh bag (try this one from the Grape and Granary), a really long stirring spoon or mash paddle (again, G&G), and empty beer bottles (a perfect excuse to drink more beer — like you needed one). I also strongly recommend getting an immersion wort chiller (sure, you can just make a huge ice bath, but who has the time?). Do you remember all that cleaning I mentioned? Yeah, that’s about seventy-five percent of the brewday. It’s really important. While I washed dishes, sanitized counters, and mopped the floor, Anne Marie herded the pets out onto the porch. A single dog hair or the tiniest gnat can ruin a whole batch, so be careful. With everything sparkly, we filled our pot with five and one-half gallons of water from the sink, then two-person-lifted the big ‘ol thing onto the stovetop. Our pot was big enough to cover two burners, which was great (more heat = shorter brewday). The next forty-five minutes or so was a waiting game. For this recipe, we wanted the water to be at one hundred forty-eight degrees Fahrenheit during the mash. We raised the heat ten degrees higher than that to account for heat lost when adding the grains. It’s a great time to crack open your first beer and maybe play a game of cards. That’s what we did. 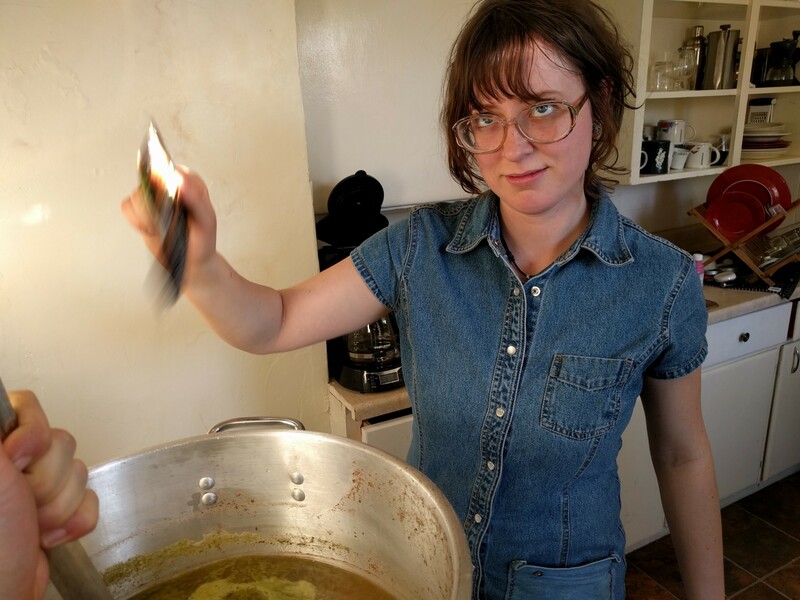 Once the water reached our desired temperature, we killed the heat, lined the pot with our mesh bag, and poured in our grain bill (I poured, Anne Marie stirred). We checked the temperature again. 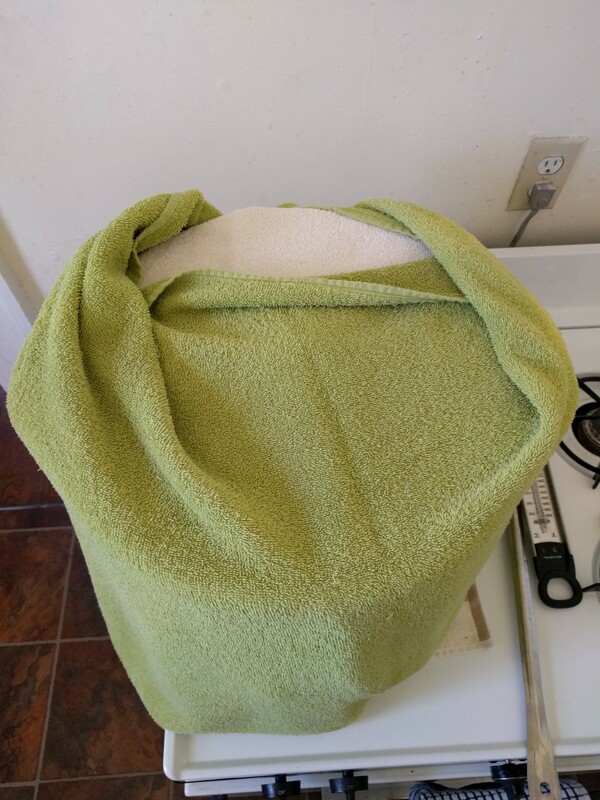 It was right on target, so we wrapped the pot up in towels and set a ninety-minute timer. We continued to check the temperature every twenty minutes or so, adding heat as needed. Magic was happening in that pot. Starches in the grains were being broken down into sugars (read: yeast food). What was once water was turning into something called wort. We’re not brewers, we’re wizards. 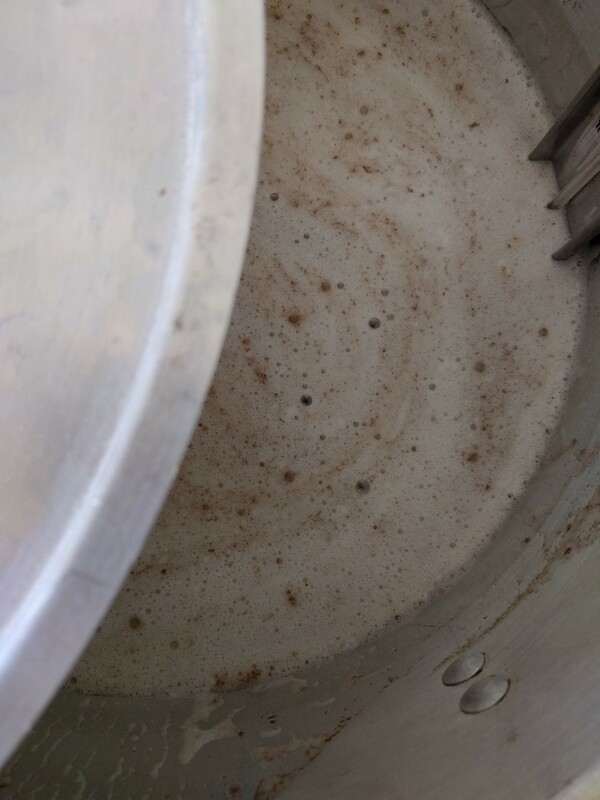 On a normal brewday, after the mash would come the boil. This wasn’t a normal brewday. We were making gose. We used our immersion chiller to bring the wort down to about 90 degrees, added lactobacillus, put a lid on the pot, and hid it in an undisturbed corner of the house. I’m still scared of this stuff. We let the pot sit undisturbed for two and a half days. During that time, the lactobacillus was doing some weird stuff. It was eating some of our sugars and pooping out lactic acid. Sorry, yeast. I knew you wanted all of those sugars, but sharing is important. We needed that lactic acid to make our beer sour. I’m sure you understood. I was nervous to look inside the pot. Would it be full of mold? Would a gelatinous cube burst forth and dissolve my face? The temptation to ignore the pot and pretend none of this had ever happened was overwhelming. But days had passed and it was time to continue brewing. I lifted the lid. Nothing happened. It smelled a little bit like cheese. My fears had been unfounded. Or so I thought. We returned the pot to the stove and cranked up the heat. We needed to get the wort boiling. As the temperature rose, so did the smell. What started as a mostly inoffensive cheesy aroma intermingled with the scent of toe jams. Beneath it all was the smell of something sinister. 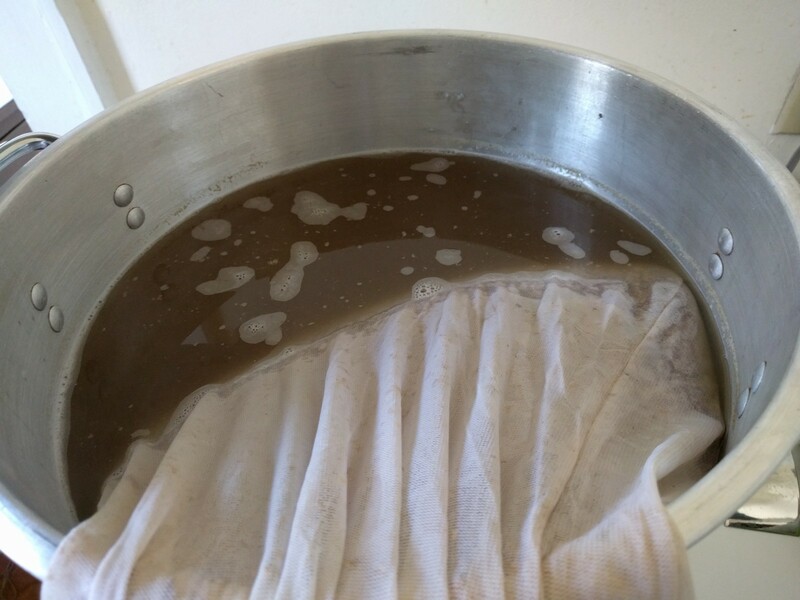 The wort after two and a half days of getting funky. We’d gone too far to turn back now. We brought the wort to a boil, put sixty minutes on the clock, and added the first hop addition: an ounce of Hallertauer. The hops cut into the evil smell quite a bit — a ray of hope. While I kept an eye on the wort, Anne Marie prepared the rest of the ingredients. She chopped the mango, crushed the coriander, and measured out the cayenne and sea salt. Fifteen minutes left of the boil. We added an ounce of Citra hops. Ten minutes. We added the mango, cayenne, and coriander. Five. Sea salt and the immersion chiller (to sanitize with heat). Zero. Flameout. 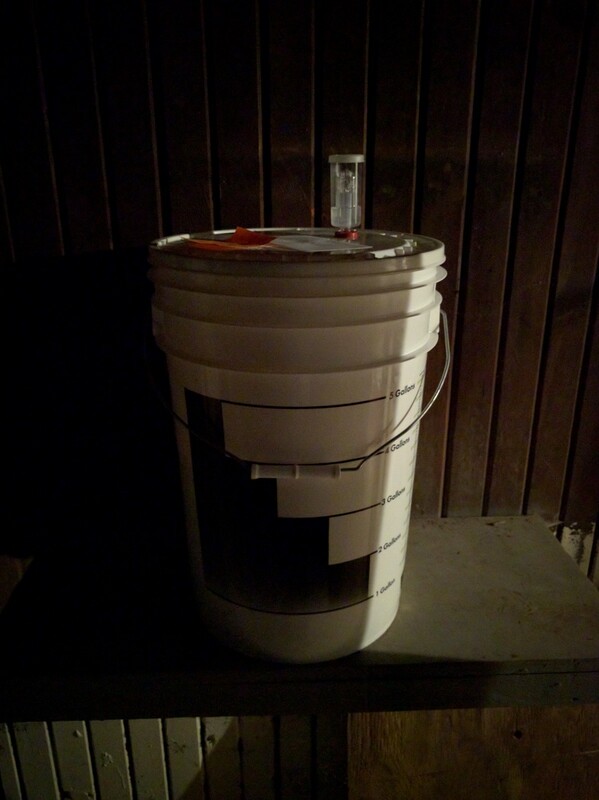 Cooled, yeast added, safe in the basement. 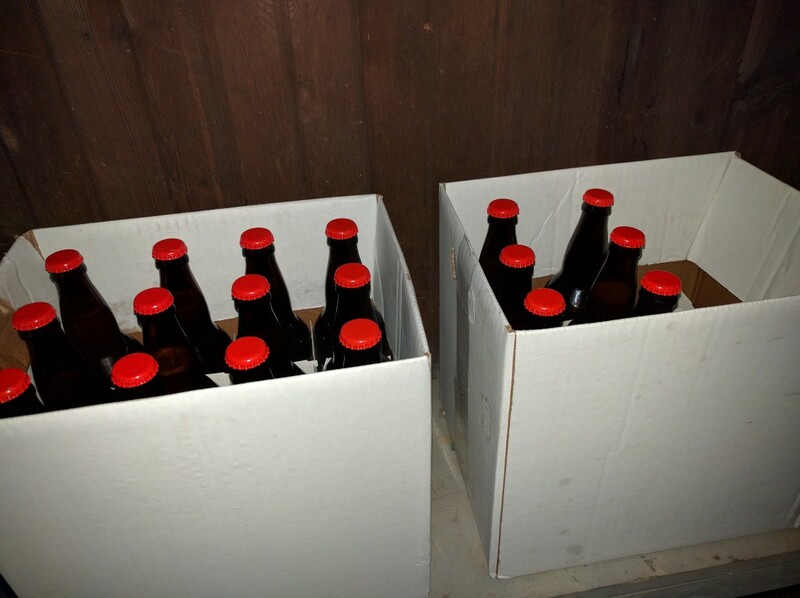 After it had spent two weeks in the basement, we bottled our beer. 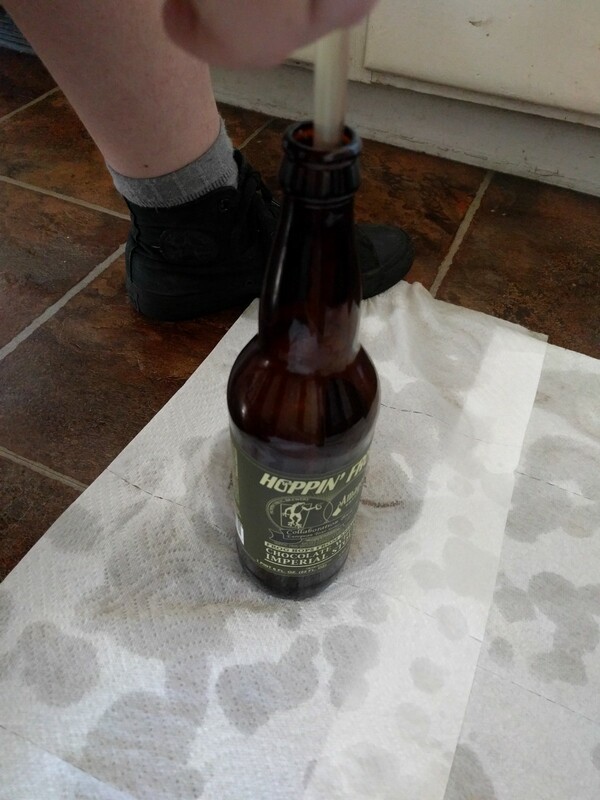 After two more weeks in the bottle, we tasted our beer. Eh, not bad. The cayenne flavor is really nice, but it kind of overpowers everything else. Except the cheese smell. I’m hoping things will balance out a bit after another week or two. I’ll keep you updated. In the meantime, it’s still pretty drinkable. 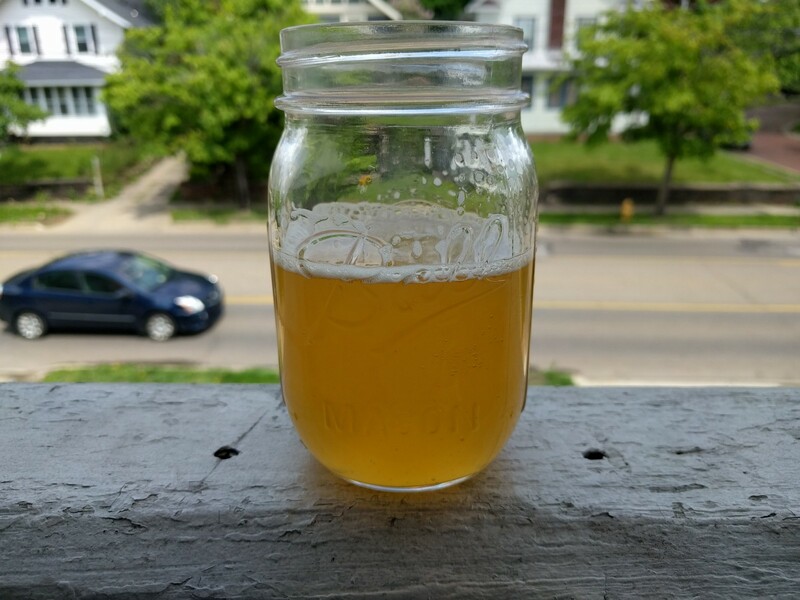 Here’s my recipe, which was heavily inspired by David Carpenter’s gose recipe. 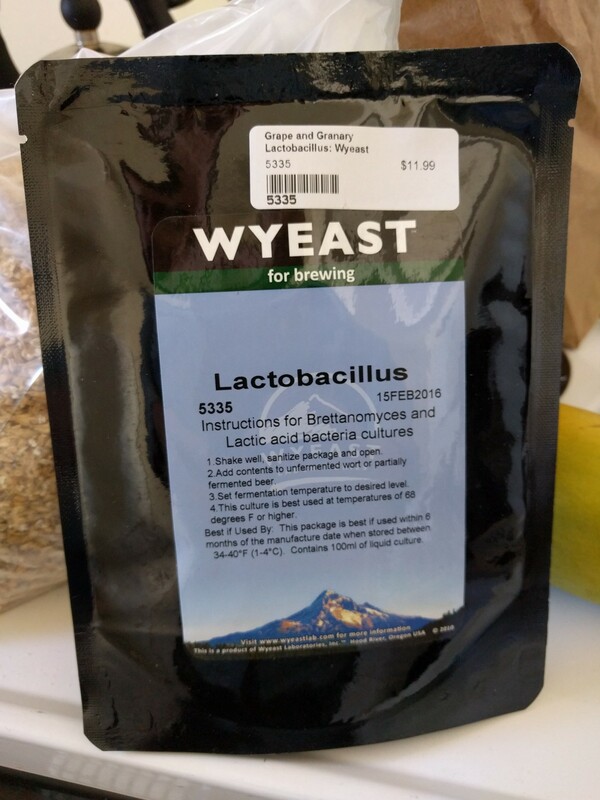 If you end up brewing it or something similar, please let me know how it went (on Twitter or wherever)!